The Republic of Ireland and Northern Ireland have the lowest number of breeding birds of prey species among European Union countries. Ireland currently has 8 breeding species followed by Luxembourg with 11 species of breeding birds of prey. Great Britain has 15 breeding bird of prey species. There is good documentary evidence to support the view that Ireland has lost at least 6 breeding birds of prey. These extinct species include Red Kite, White tailed Eagle, Osprey, Golden Eagle, Marsh Harrier and Goshawk (D’Arcy 1999). Golden Eagles are currently being released in Donegal, Northwest Ireland, and the project has been progressing well over the last 6 years. The Common Buzzard has naturally recolonised Ireland over the last fifty years. Red Kites are a missing part of Ireland’s native biodiversity and were lost entirely through human activities, primarily persecution and deforestation. The Red Kite is being reintroduced to Ireland in a project managed by the Golden Eagle Trust in partnership with the National Parks and Wildlife Service and the Welsh Kite Trust. 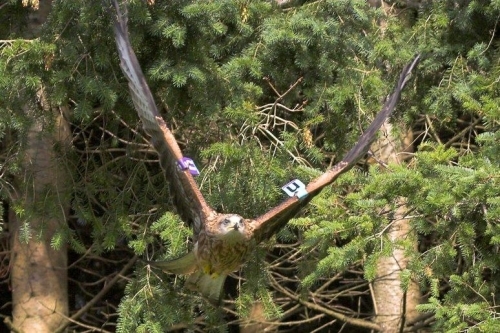 The techniques for collecting, transporting, rearing and releasing Red Kites are well proven due to 17 years of experience with the Scottish and English release programmes. Birds will be collected from nests in the donor area, Wales, at 5-7 weeks of age. After collection, the young kites will be transported by road and ferry to the holding aviaries in Wicklow. The birds will be fed and reared in the aviaries and when old enough will be released into the wild. Prior to release, all birds will be fitted with individual wing tags and radio transmitters to ensure the effective post-release monitoring of the fate of individual birds.